Don’t call it a comeback! Or actually, definitely do, because the formerly minuscule beer haven has returned as a whole new Abbey after the owners tore apart the former digs, then carefully pieced them back together to create a much roomier, refurbished wood-lined interior they claim “brings it up to the 21st century", so presumably a guy with a mustache in a white jumpsuit will have about 100 shopping carts fall on it and an identical bar, just to prove a point. What to expect: The Look: The hole-in-the-wall vibe hasn’t gone anywhere, but the space was almost doubled by demolishing the original wall and using its refinished wood to create features like a long communal table (lined with industrial metal stools), raftered barn-like ceilings, and a row of booths. 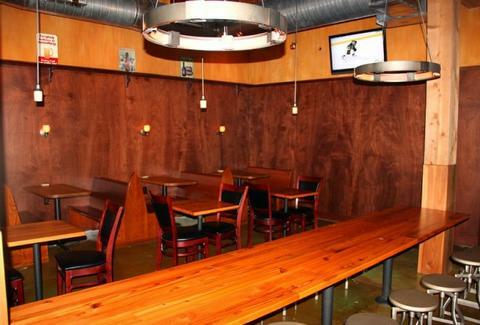 Plus, they transformed the vintage shuffleboard table (formerly a counter) into the new bar, allowing you to make all sorts of “go puck yourself” jokes that'll be hilarious even when you’re not conversing with the ugly dude from Real World. The Booze: Brace yourself: they're not just serving beer anymore. So, while you can still nab all the Abbey favorites, plus the new Maybach (a toffee-like German-style) and Abbey Double (chocolate-/raisin-infused dark brown mahogany Belgian), in about a week they’ll also host a heady lineup of bourbons and Scotches like Balvenie 12yr Portwood, 117-proof Macallan Cask Strength, and the rare Four Roses Marriage, which no doubt has led many men in one to buy a dozen. In another stellar return, at some point in the next month, they’ll start carting in a cauldron full of sauerkraut, habaneros, and beer-soaked dogs for "Free Hot Dog Sundays", an indulgence that will almost certainly raise your non-car insurance premiums.